Close the bloody door behind you! D’you think we’re paying to heat the whole neighbourhood? He’s really regretting that comment about eating his hat now. Oh, and I thought the artist was Steele Sausage. But that’s something completely different. And what’s behind him would make a lovely ornamental wreath for the holidays. Lower right corner…world’s worst ruff, or a head walking around on tentacles? Only Steele Sausage knows for sure! BEHIND YOU! tag applies to almost every figure on the cover. Trippy. If the sorcerer’s mother is still alive things are going to get rather difficult for Lord Owen. Once you cross the threshold to Hell, it’s only seven footprints to Satan, so he doesn’t have so far to go. Pay absolutely no heed to the petrified fighters behind him. He’s just grumpy about being woken in the middle of the day, alright? Why are fantasy heroes always such overachievers? He didn’t have to go all the way to the Gates of Hell… just smash the bloody thing with a mallet or something! 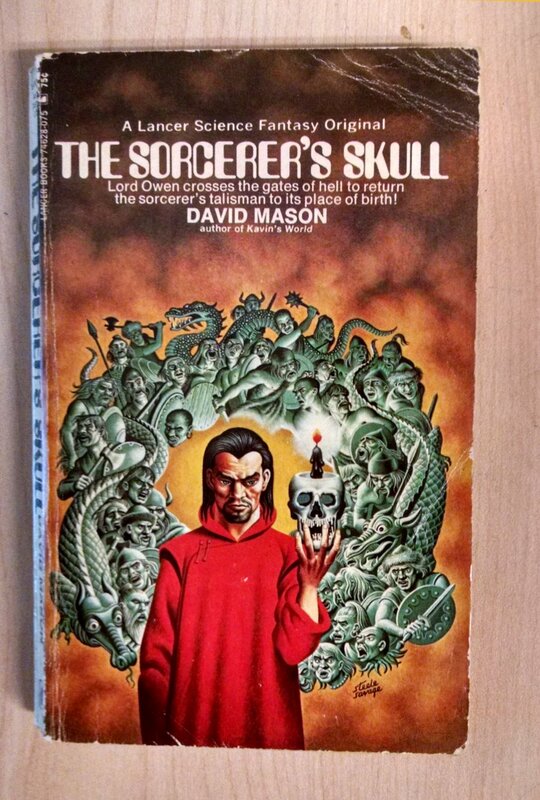 Lord Owen finally gets around to crossing the gates of hell to reluctantly return the sorcerer’s talisman to its place of birth, and suffers from apathy the whole way. @BC: He did nothing of the kind! You’re believing all of his tall tales.